It is sweet potato season in Louisiana. These little golden orbs are everywhere. In the stores, on the side of the road, in the markets. It would be a shame NOT to cook with them so when it came time to find an entertaining dish for I Heart Cooking Club‘s EASY ENTERTAINING theme I went with sweet potatoes. Cook 1 tablespoon peanut oil, 1 chopped onion and 1 tablespoon Thai green curry paste for 1 minute. Add 600g (20 oz) peeled and finely diced sweet potato and 3/4 cup (6 fl oz) coconut cream and cook, covered, for 10 minutes. Add 1/2 cup thawed frozen peas and 2 tablespoons chopped coriander (cilantro) and allow the mixture to cool. 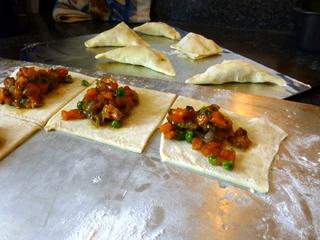 Place in the middle of 13 cm (5 in) puff pastry rounds. Press to seal the edges, glaze with beaten egg and bake in an oven preheated to 180°C (350°F) for 20 minutes or until puffed and golden. Serve with yoghurt blended with mint. Makes 12. So quick and so very easy to make. And so very easy to EAT!!! They were perfect for a small luncheon. Even with only 1/2 of the filling I had 9 nice sized puffs. The last time I used the green curry paste it was too hot so I cut back to 1/2. Then it wasn’t spicy enough. But that is what learning new things is all about – finding just the right mix. The coconut blended easily with the sweet potato flavor so it was hard to tell where one ended and the other began. Good, tho’! After I made these I realized they were a lot like the samosas I made last week for Potluck. Next week’s theme is Fast and Fabulous. Wonder what kind of hand pie I can do for that?? 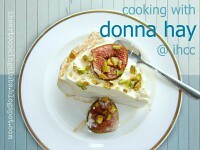 The recipe came from Donna’s off the shelf: cooking from the pantry on page 142. It’s party time at IHCC so come on over and enjoy the fun, food, and frivolity!!! I’m always trying to figure out how to get just the right amount of heat with curry paste! Same as you , I can’t take too spicy curry, alway cut down the paste and add more coconut milk 🙂 . Using sweet potato as curry puff filling sounds a good idea, I think I can have a few of your curry puffs, so delicious! 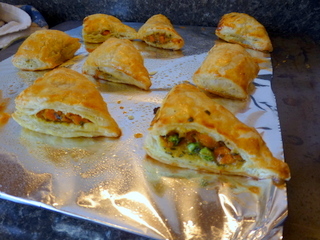 OMG, I love sweet potato, and the filling for these little curry puffs sounds amazing. This is definitely one for me to try – this is the kind of thing I love for a light and easy Sunday night supper. The hand pies look delicious; sweet potatoes with Thai curry sounds like a fabulous combination. This looks really good! With the curry paste and chopped coriander, I can just imagine how tasty this is! I so want to make these but a question … is coconut cream the same as full fat coconut milk? I really don’t know. I think the cream would be thicker and sweeter. I am seeing sweet potato recipes everywhere today – it’s obviously the season for it. These sound good. I got a good giggle when you mentioned making hand pies for two weeks in a row. I can see why! They are certainly delicious little portable meals, aren’t they? I tend to favor any type of hand pie because they are such special little treats. I’ve looked at this recipe several times and I think it sounds like a wonderful opportunity to use all the sweet potatoes popping up all over the place. Delicious! Love making hand pies. Need to make some more.